There was a time when the thought of catching a flight would make my eyes sparkle. Then I started catching about 4 flights in a month! Soon, I just wanted to reach my destination and flight became a necessary ‘thing’ to get there. 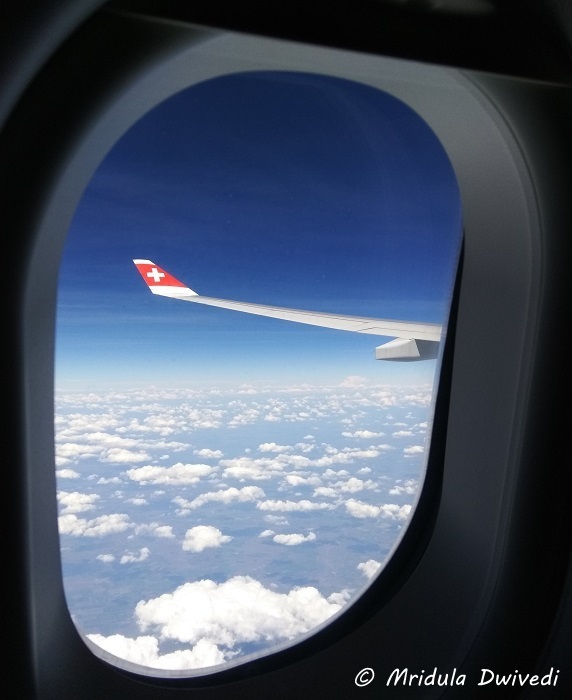 I was saying to someone recently, “I no longer enjoy flights, I just want to be arrive at my destination.” But flying Barcelona Zurich Delhi with Swiss made me pause. I thoroughly enjoyed the flights! And they were regular economy flights! My flight tickets were given to me by the Catalonia Tourism Board in Spain, so even though I was on a sponsored trip, Swiss had nothing to do with it. I was another regular passenger for them! On the Barcelona Zurich leg they gave croissants for snack, the vegetarian me was delighted. On short legs, vegetarian options are often not a priority. Their tea was decent too. 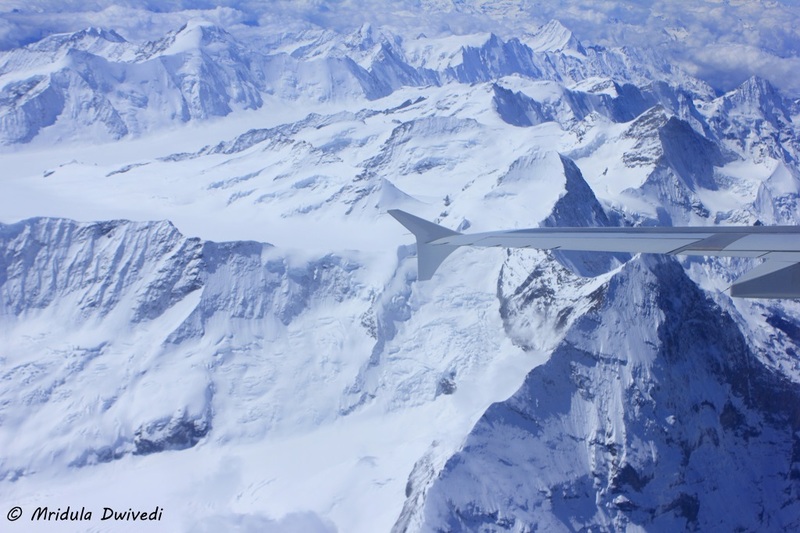 Flying Over the Swiss Alps! Then we flew over Alps and the whole plane went gaga over the scenery. I was seated in the last row at the window seat. There was an Australian couple sitting next to me. We took turns to click pictures of the Alps! There was congestion at the Zurich Airport so our flight got delayed for about 15 minutes. To circle we went over the Alps again! I like that kind of delays. I had very little time between my Barcelona and Delhi flights. But the immigration at Zurich was super organized. I cleared the immigration, bought macaroons for home and still made it to the Zurich Delhi plane in time! 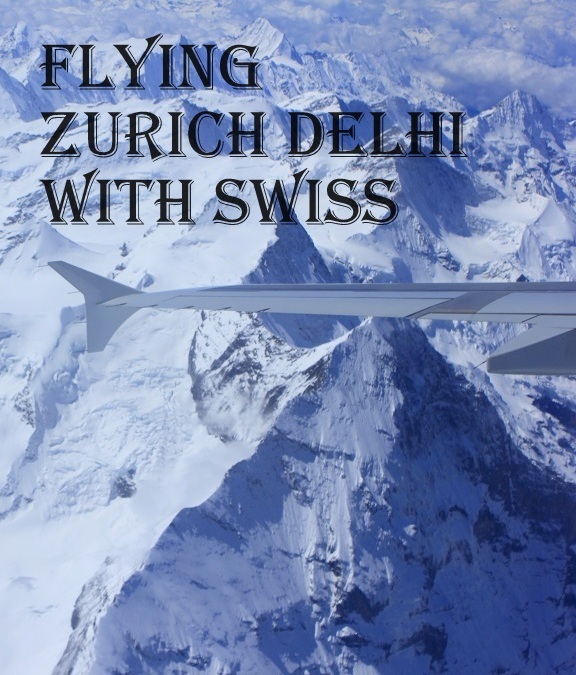 The Zurich Delhi flight departed as per schedule! We were soon at the cruising height. The meal service started promptly. I have very little expectations from airline food. On top of that I am vegetarian. 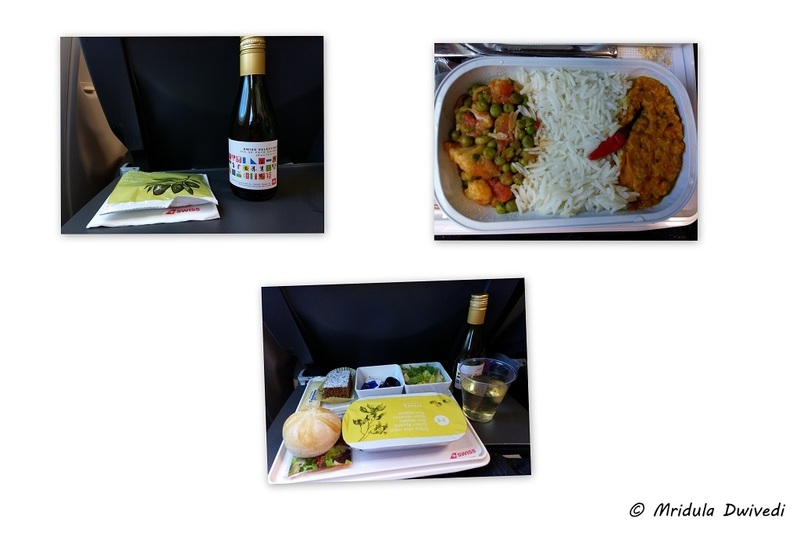 But the food on the flight was really good! It was a simple, vegetable, rice, and daal but it was flavorful and not overheated. And at the end they gave a bar of chocolate too. But it was the crew that made the real difference. I saw one lady lifting a not so small child and walking in the aisle! And one of her colleagues smiled at the scene, his smile could have lit an entire stadium. The crew gave the feeling that they enjoyed their work. When I travel abroad I miss my tea. I doubly missed it in Spain as they somehow don’t put tea and coffee in the hotel rooms. When the tea service starts on a plane, I get on a high alert. If you blink and miss the cabin crews’s gaze when they are passing by you, they never give you a second glance! I hate to make a fuss, but for tea I end up doing that too. I loved the Swiss crew’s tea and coffee service. They were in no hurry and they would wait if you by any chance missed out the first eye contact! And that for me is the epitome of good service. I have got exceptional tea service before, but then I was flying business on that occasion. 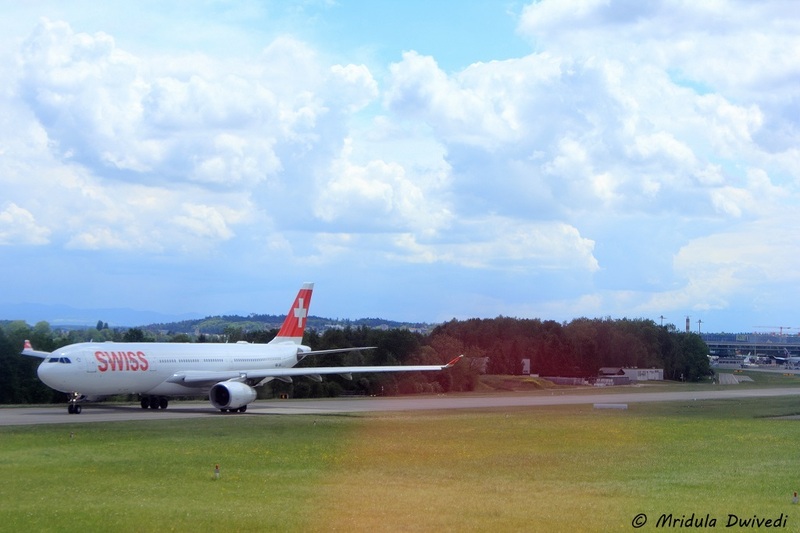 It Was a Pleasure to Fly Swiss! By the time the plane landed at Delhi, I was ready to take back my words. I still do enjoy flying! Thank you Swiss for making my ordinary economy flight such a pleasant one! In the end it is the small things that count, like a smile, a chocolate, not rushing through and the like! 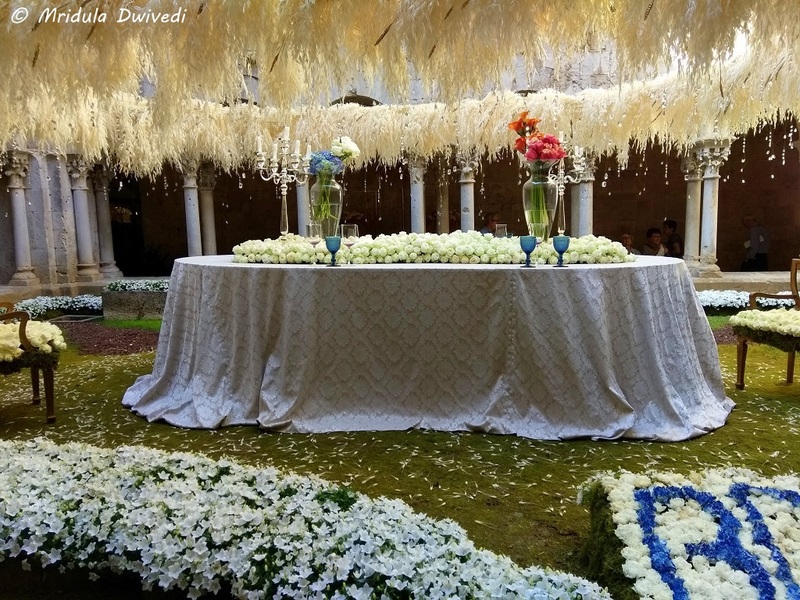 I was lucky to attend the Girona Flower Festival 2017, known as Temps de Flors. 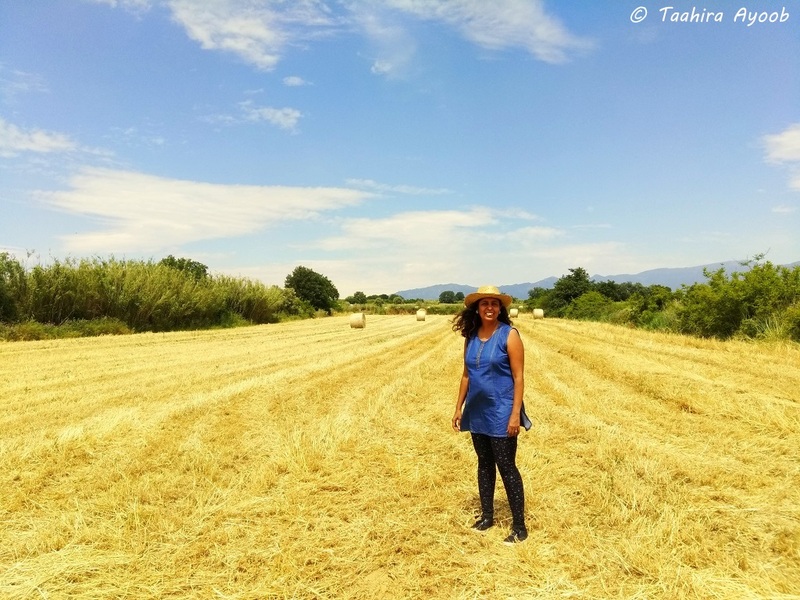 This was my first visit to the beautiful region of Catalonia in Spain. 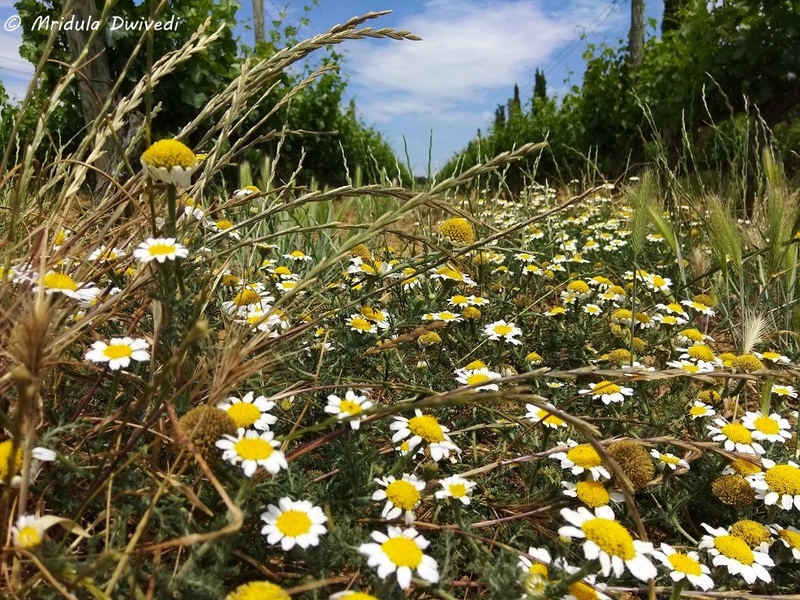 The Temps de Flors started in 1954. 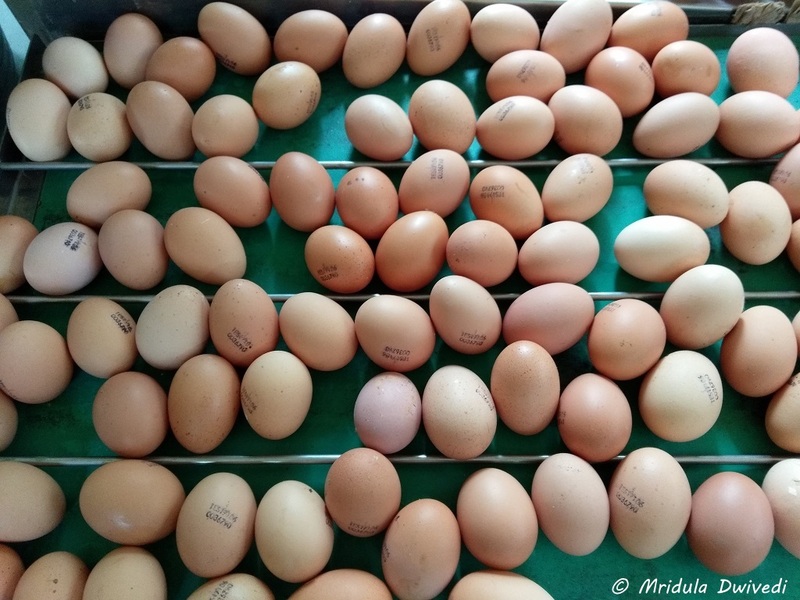 This year it was held from 13 to 21 May. 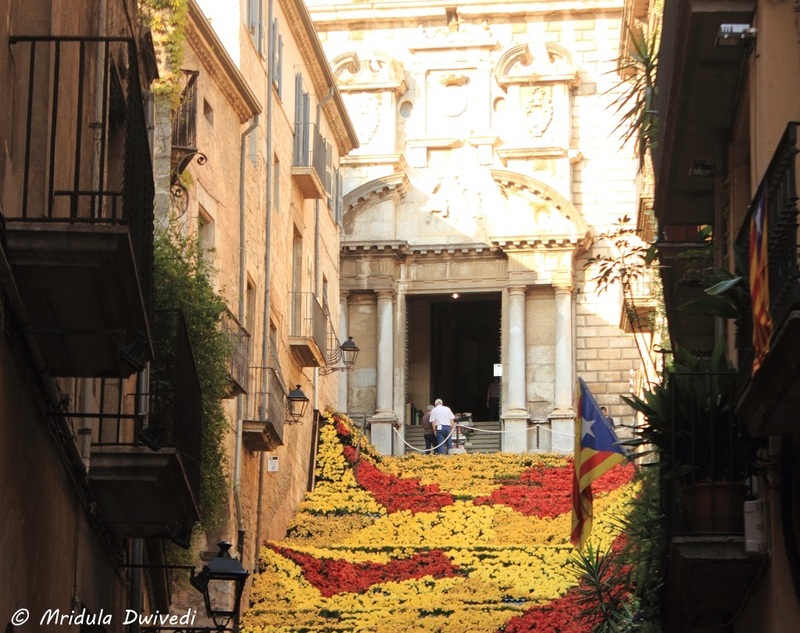 The beautiful city of Girona gets decked in floral arrangements every year in May. The event attracts large crowds of both locals and tourists. 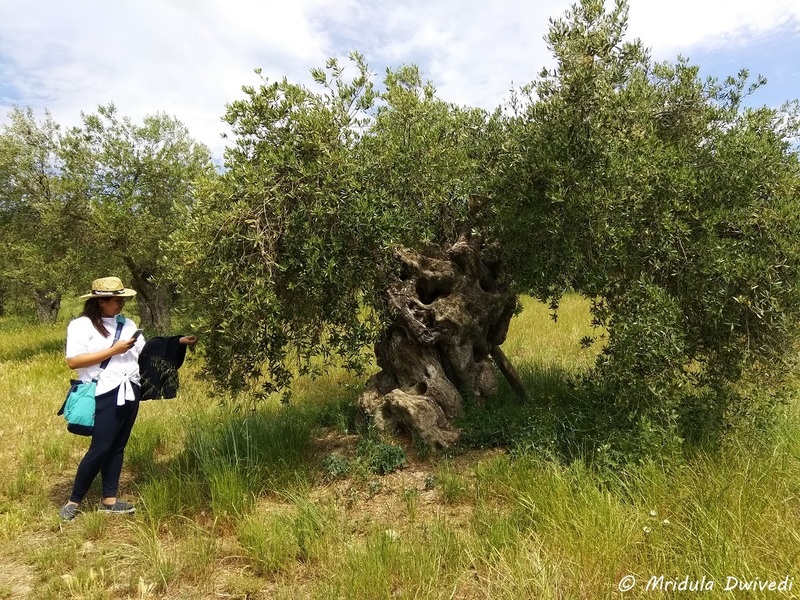 I was invited to Visit Catalonia by the Catalonia Tourism Board. 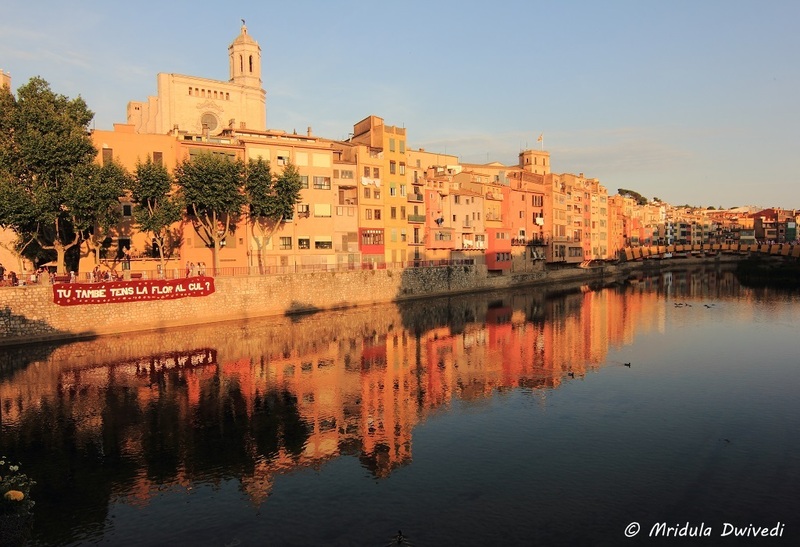 The River Onyar divides the town of Girona into two parts, the old and the new. The flower festival happens in the old part. One of the bridges on the river, the Palanques Vermelles bridge (1827) was built by the Eiffel company of the Eiffel Tower fame. We were given a map of the floral route in the city of Girona. But paper maps are the ultimate mystery to me, the only maps I can figure out is Google Maps. And that too because the dot moves away from the path if I start walking in the wrong direction! There were 62 exhibits this year, that should give you some idea about the scope of the festival. Who Says Bankers Don’t Have Imagination? 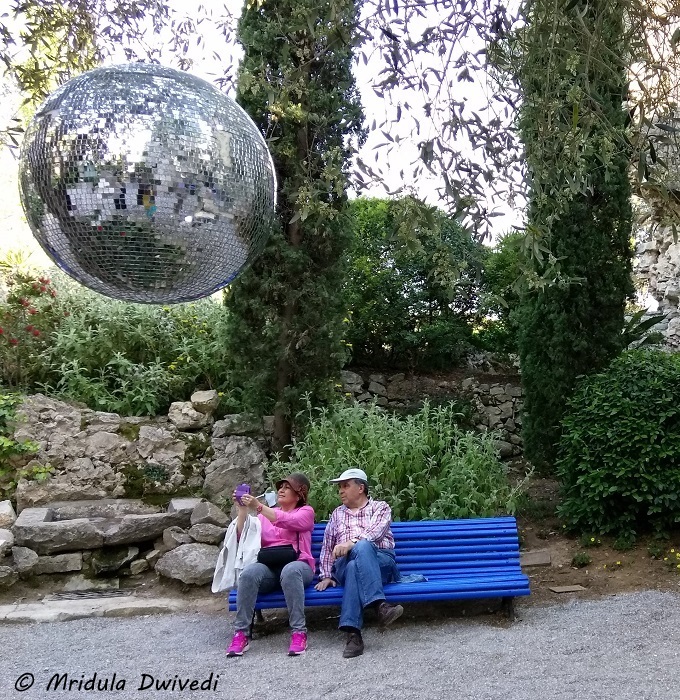 The floral displays happen inside the monuments, town squares, open courtyards, gardens, and more of the Barri Vell neighborhood. This predominantly white floral display was designed by a group of bankers, now who said bankers were the most boring people? 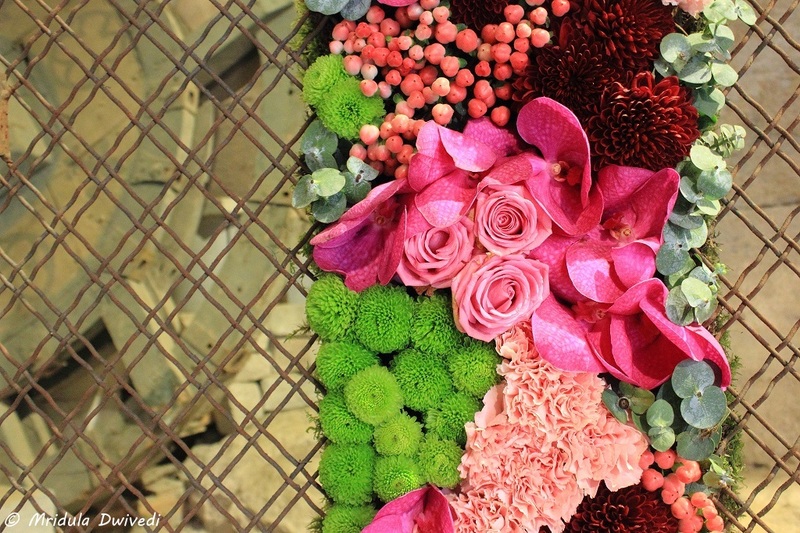 Where Flowers and Technology Mix! The designs are created by local designers and organizations. Not only floral genius is on display, but technology is used to enhance the experience. Thanks to technology I could see this scene as day and night within a few seconds! I preferred the night scene to the day one. The themes have interpretations, our guide gave us to them. But she also said that as the famous Catalonian artist Salvador Dali believed that the best interpretation is the one, that you define! 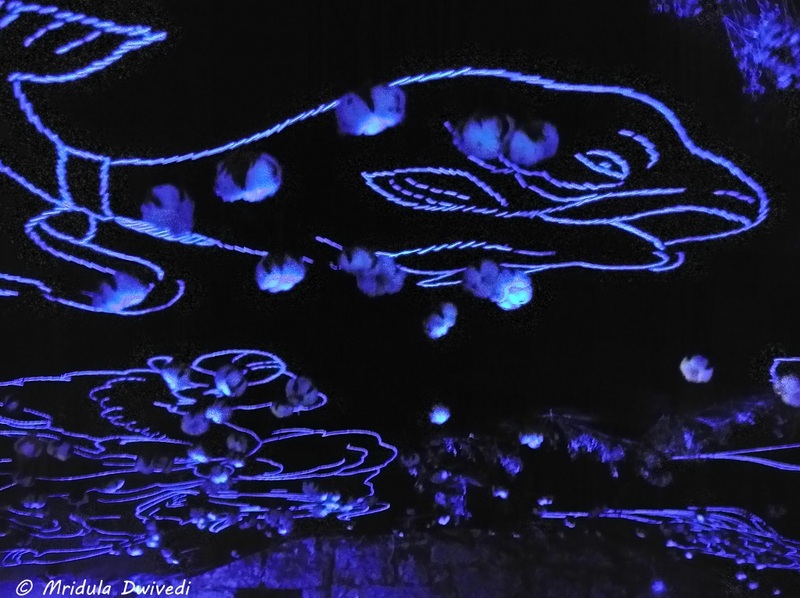 At Temps de Flors staircases become canvas for artists. I am going to continue in the tradition of Dali and give you my interpretation of this scene. I thought the artist tried to create the colors of Catalonia! This was one of the popular displays! Our wonderful guide, Anna Aliu, told us that artists often pick up regional themes. 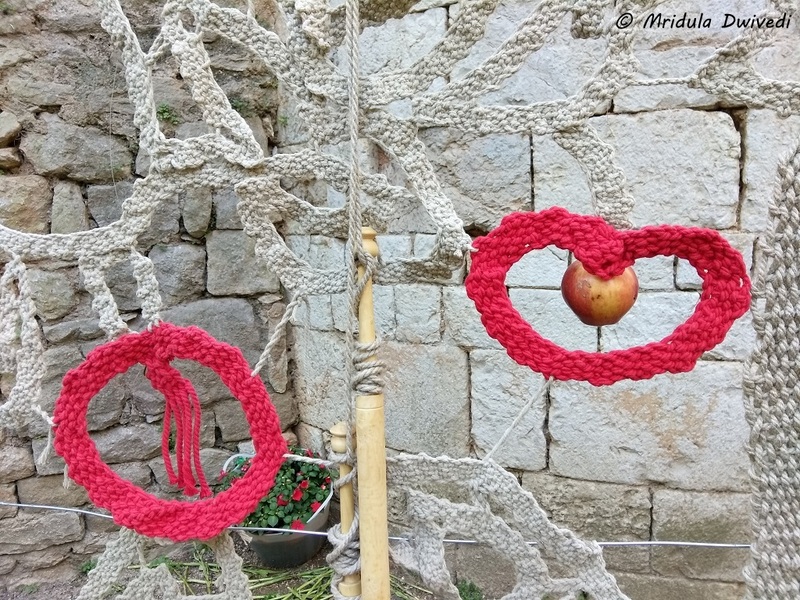 Apples grow in plenty around Girona and they were present in many displays. Enjoy it Like the Locals! 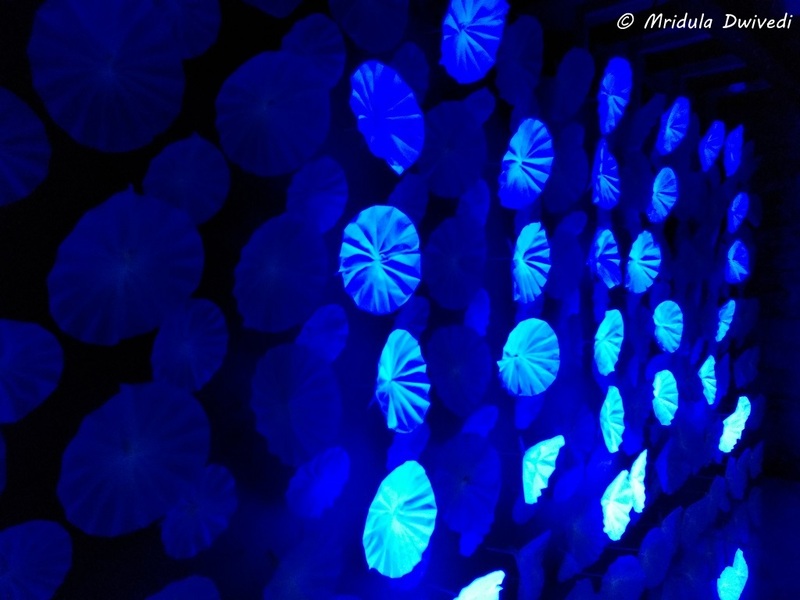 The best way to enjoy the Flower Festival would be to take it slow. It is spread over the old town and it takes a while to walk through it, even partially. If you were a local you could always come the next day! I spent around three hours here. Our schedule said two hours but we didn’t get out before three, that too reluctantly with me often bringing up the rear! 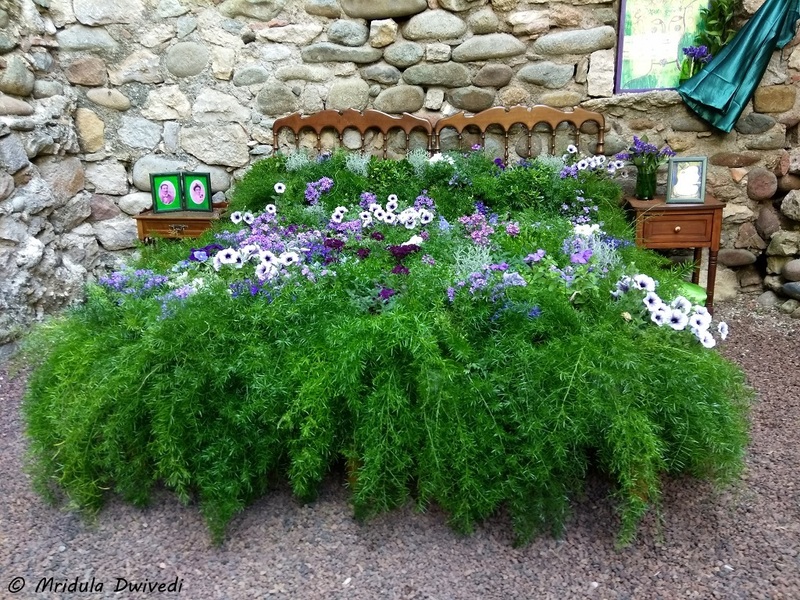 Flowers and Technology in a Medieval Castle! We went there on a week day and the place was still crowded. Allow yourself time because the popular displays have a queue. When I say of a queue don’t think of an Indian queue though, here you will get a well ordered queue with people who are patient and polite. Still, keep this in mind when you allocate time to the festival! 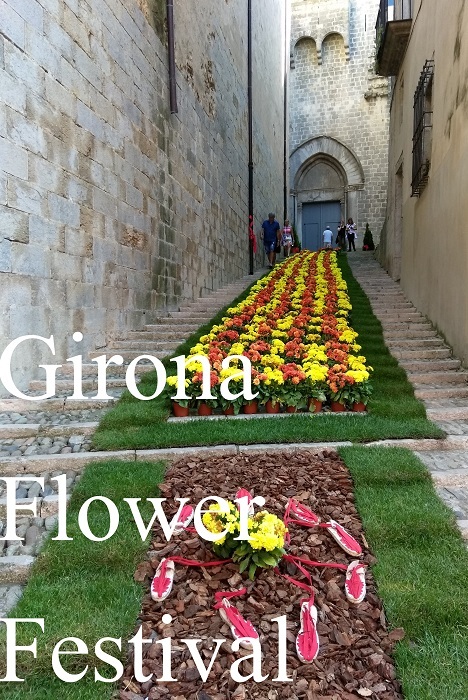 If you are staying in Barcelona and you wish to hop over to Girona for the flower festival, it is entirely possible. We took the Renfe Fast Train from Barcelona to Girona, it takes just 40 minutes to reach. 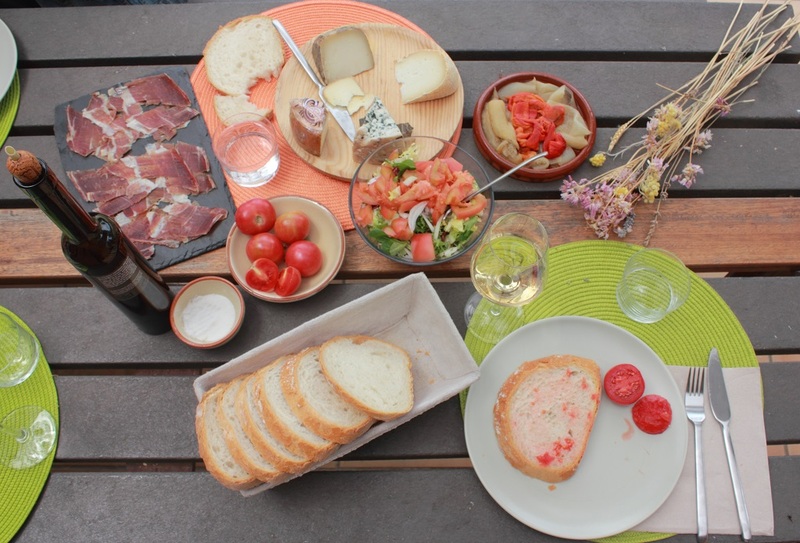 However, if possible stay at Girona and enjoy the festival leisurely. 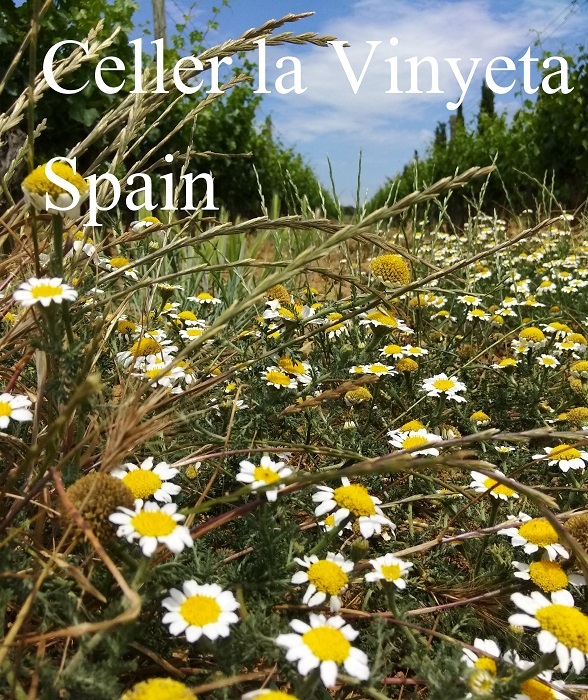 Girona- They Say it with Flowers! 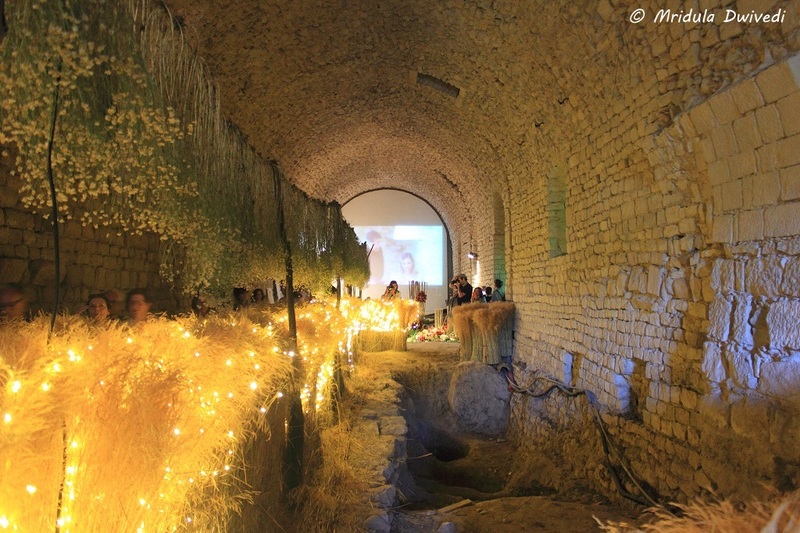 Girona Flower festival is a treat to the senses. From bright to sublime, they say it in different hues. Many old houses that are closed to public otherwise, open up their doors for the flower festival. 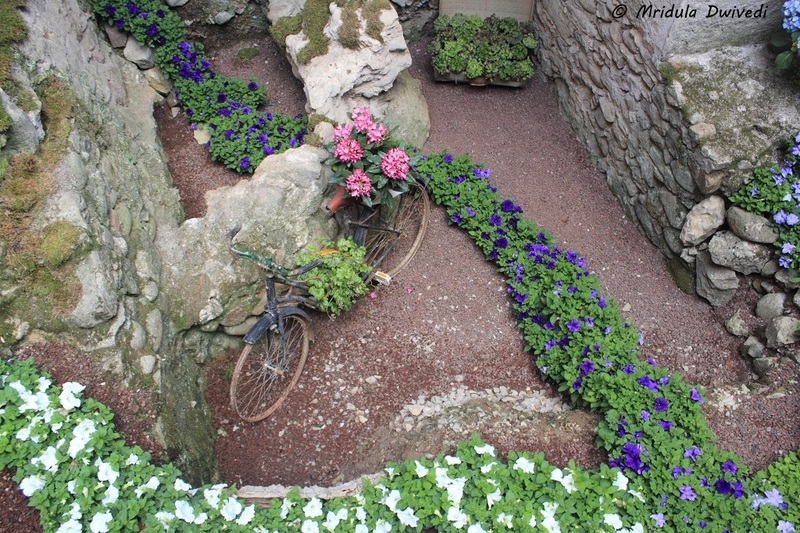 Girona is a charming place on is own, but with with the flowers it was irresistible!